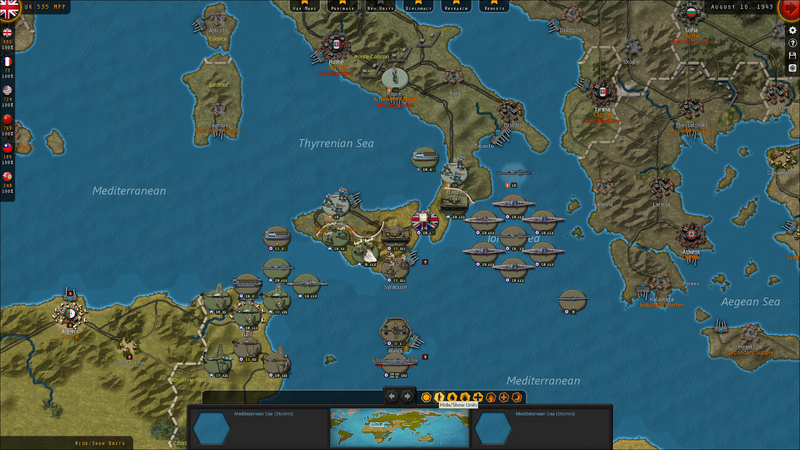 Fury Software and Matrix/Slitherine Games give you ... World War II. All of it! 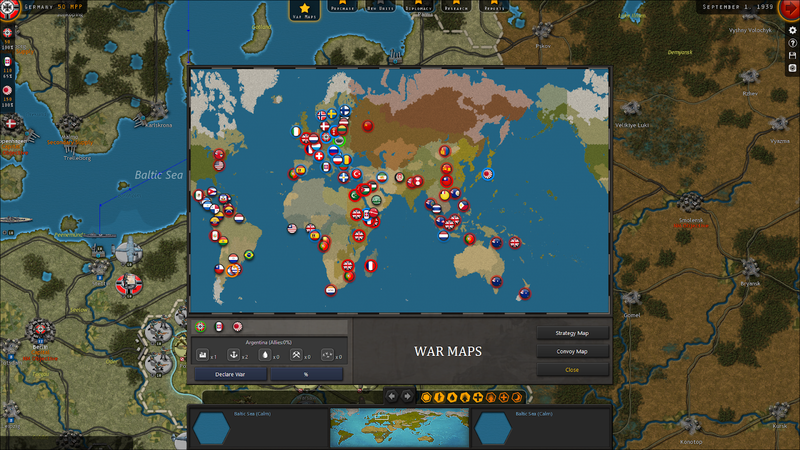 Huber Cater's masterpiece of game design has been extended to cover the entire world at war. Not only the map is bigger, but some features have been added compared to the former War in Europe. 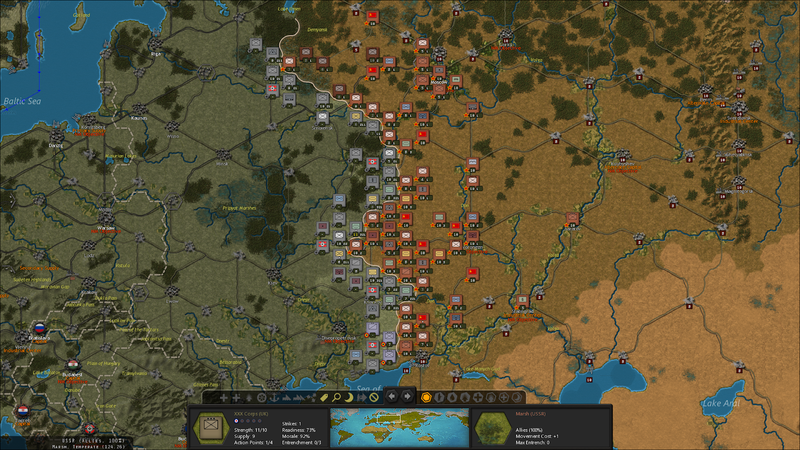 Land units represent Headquarters, Armies, Corps (including mechanized ones), some Divisions and Brigades, Special Forces, Engineers, Paratroopers, Cavalry (Brigades, Divisions and Corps), Static Defensive Positions, Anti-Aircraft Units, Rocket Artillery, Heavy Artillery, Partisans, Light/Medium/Heavy Tank Units (Divisions and Corps from what I saw in-game), Armored Trains and more. Air units represent air fleets of tactical/strategic (medium, strategic and maritime) bombers and fighters. Naval units are flotillas and fleets: combat and support vessels grouped around a capital ship. Playable as Axis (Italy, Germany and Japan) or Allies (UK, France, US, Poland, China, India and the Soviet Union). Play as each country or as the whole side. Campaign and Map editor included. Multiplayer not tested for this preview. This is a military grand strategy game with a simple and clear economy model focused on military matters. The world modelled in Strategic Command is geared for war and as such there is no room for the player to make decisions on national interests, national threats, the formulation of domestic and foreign policies. The diplomacy aspect is limited to influence the different actors and to declare war on them. Being handed a country or a coalition already congealed and lock and loaded for war is great for those looking into jumping straight into WWII, but will leave empty handed those who like to build a country from peace time. Not that the later will be empty handed forever: this game features a powerful editor and has a very active modding community. So, the sky is the limit. The first and possibly biggest decision for us was to return the series to using hexes rather than tiles. There are pros and cons to both, but it was clear that the majority of those who expressed a preference, preferred hexes, and we didn't disagree. So hexes are back! • Both Germany and the USSR get to negotiate carving up of Poland. The subsequent borders will therefore not necessarily follow their historic path. • An Anglo-French Expedition can be sent to support Finland during the Winter War. • France can reincorporate Vichy territories following her liberation. • The UK and USSR can carve up Persia between them, and the USA can then choose whether to send supplies via Persia to the USSR. This can provide a real boost to the Soviet War Effort! 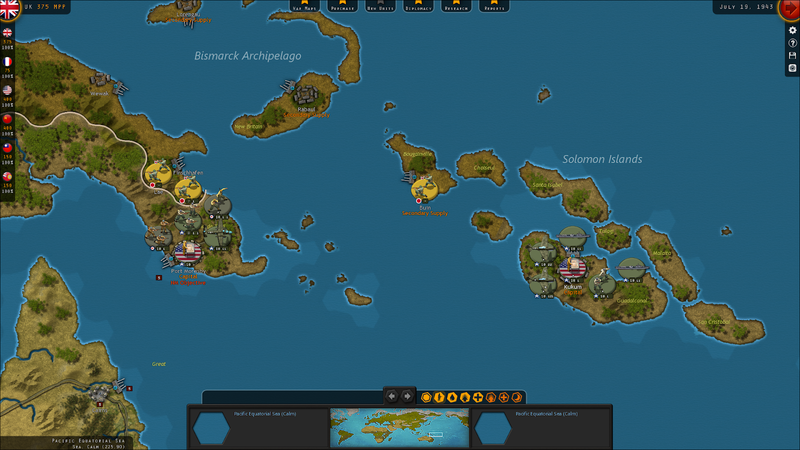 Players can also minimize the Decision box to examine the map further prior to making their final decision and many decisions have additional notes providing any necessary historical context as needed. A major change that players of our previous titles will immediately notice is the introduction of Dynamic Movement. Dynamic Movement allows units that haven't used up all their Action Points to continue to move until they have done so, even if de-selected and re-selected again later. It applies to most unit types, and takes much of the pressure out of trying to plan your moves. Just click and play! Air units can also now attack and then move a portion of their normal move distance. This can be especially useful when on the offensive, or alternatively when conducting a fighting retreat. Again, it provides more flexibility than in the past when air units could only either move, or attack. We have introduced enhanced Fog of War, a shroud over the map, which makes it possible at a glance to see exactly how far your own units can see. While this might sound very simple, it wasn't in our previous releases, and at the same time we have also introduced a specified graphical Front Line that updates dynamically showing clearly who controls what. We now have two types of road, paved and unpaved. The latter predominate in Eastern Europe and provide no bonuses in bad weather, so when the ground is muddy, offensives will slow. 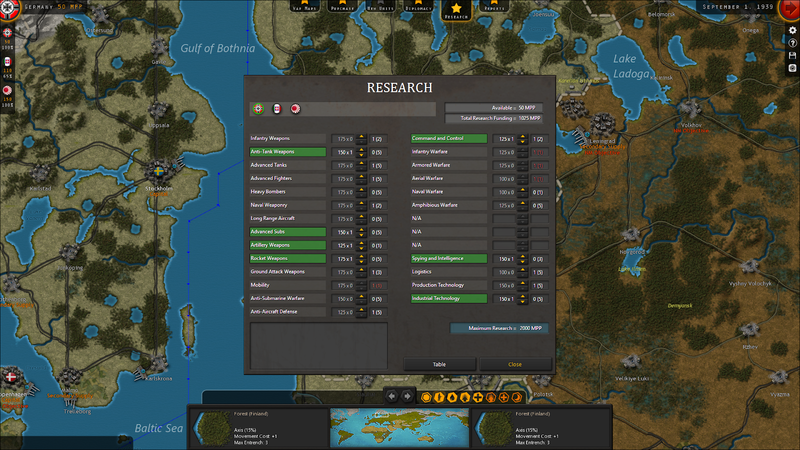 One thing we decided to do with the Research feature is to expand it beyond just enhancing unit Attack and Defense values, and increasing economic output. So we have introduced new research areas that represent improvements in command systems, unit training, military doctrine and logistics. These can for example increase unit morale, spotting ranges, command abilities and allow units to launch extra attacks. We've introduced two very significant improvements to naval operations. 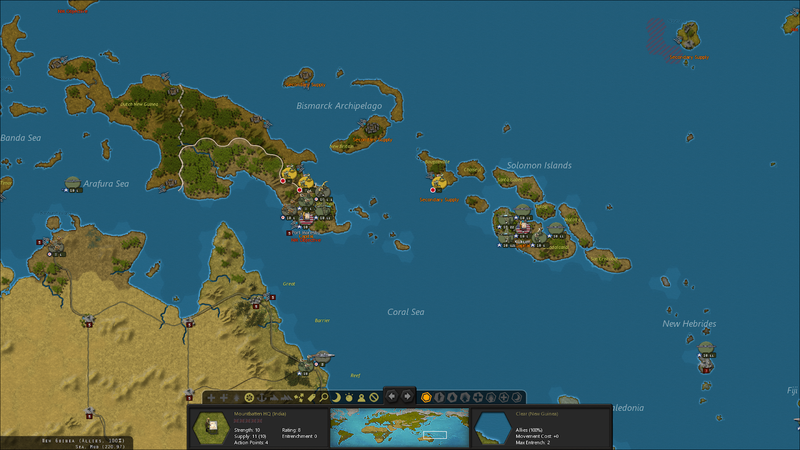 The first is to speed up naval movement through the introduction of a new movement mode: Naval Cruise. This enables naval units to travel double their normal movement distance for a strategic move. The penalty being that they lose 1 supply point when doing so, and cruising units cannot attack enemy vessels. Players of our previous releases will be familiar with Subs having two modes, Hunt and Silent, and Subs can only Cruise when they are in Hunt mode. The second big change is that we've added a second category of Amphibious Transport for landings on enemy held shores. This new unit type is specifically designed to be used when planning operations against distant shores like Operation Torch, as now amphibious units can sail across the Atlantic from the USA and land in North Africa. This new unit type, called Amphibious Transport (Long Range), is only available in limited numbers to select countries like the UK and USA, though the number of units available can be increased through researching Amphibious Warfare. It is now possible to block diplomacy towards some countries, e.g. the USSR cannot attempt to influence Franco's Spain. We have also introduced the ability to limit investment towards historically neutral countries, so that, for example, only a small diplomatic effort can be made to swing Switzerland towards one side or the other. 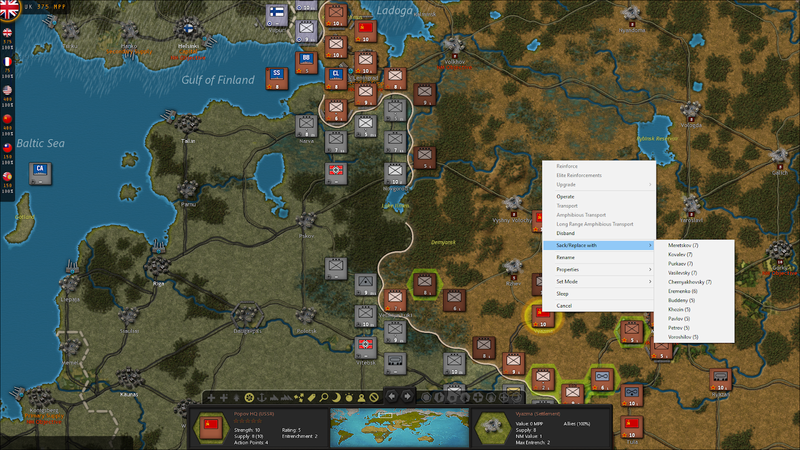 The AI has been extensively overhauled, something we do for every release, and especially for Amphibious Assaults which is especially important in Strategic Command WWII - World at War when considering not only Torch, D-Day but also the island hopping campaigns of the Pacific. Not only will the game return to hexes and include new and sharper NATO and 3D unit counters, the interface has been overhauled as well to provide a smoother and more intuitive game play experience while optimizing the amount of the game play area on the screen. A number of rule changes and game engine enhancements as well as fixes have been made to again improve the overall game play experience. This is possible as each release builds on all of our previous releases and even the fix/change list from SC3 Europe to SC3 World at War (built on the same game engine) will have over 70 fixes/changes included. With the inclusion of the Pacific Theater of Operations, the Strategic Command engine faces now the challenge of effectively handling naval warfare and amphibious operations. Amphibious operations are thankfully very easy for the user and seemingly for the computer opponent too (I’ve witnessed three landings driven by the computer opponent and they were impeccable). Naval warfare -despite the changes mentioned before- doesn’t differ too much from the War in Europe game and I am bit concerned about the inability of assembling a fleet of naval units that are mutually supporting, the combat power imbalance between opposing submarines and surface units and the lack of admirals. But at least, Strategic Command delivers a satisfactory experience overall when it comes to power projection through the Pacific. 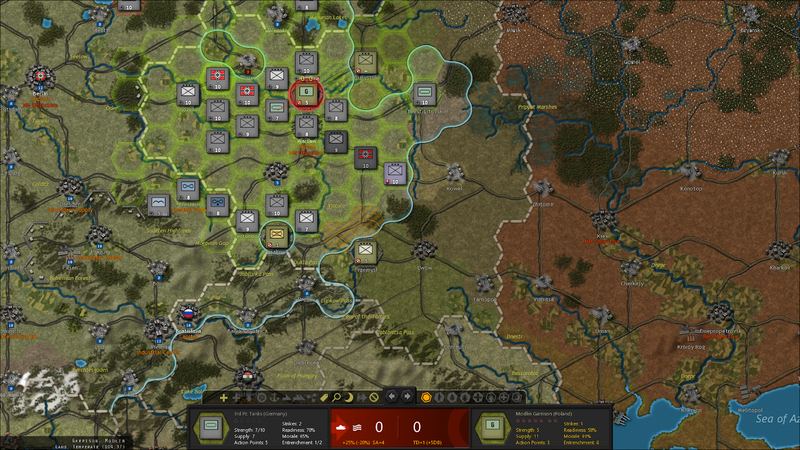 A big thumbs up for this new release, the Strategic Command franchise deserves praise for its exquisitely-designed approachability, seamless gameplay for land air and naval operations. And also for not resorting to exhaustive bean counting and for not dumbing down its world model to a mere footnote.